Praising Tim Dorsey’s tongue-in-cheek humor, the Miami Herald wrote, “Nobody, but nobody, writes like this guy.” Here Florida politics take the main stage in a rollicking satire that proves Dorsey’s at the top of his game. When a traumatic experience forever changes Florida gubernatorial race candidate Marlon Conrad’s life, he hits the road in a Winnebago to find the “real” Florida. But his odyssey is plagued with would-be assassins and cutthroat journalists. It's Funny 'Cause It's Pretty Much True! This is possibly the most hilarious book I have ever read! I laughed so hard and so often that I was afraid the neighbors would call the guys with the butterfly nets. It gets right into the heart of the political system (specifically Florida politics, but these days we can all relate.) It shines a bright light on all the dirty, hidden political tricks that we know are happening, but can't do anything about. If you've ever wanted to get a politician, lobbyist, news anchor, or rich person by the throat and shake them until their teeth rattle, you will love this book. While it's basically shooting at politics, it also takes pot shots at a lot of other pet peeves we all have. For example, there is a scene with a guy trying to make an important phone call and getting stuck in the phone menu nightmare that is purely classic! I had to keep rewinding because I laughed so hard I would miss stuff. If laughter is the best medicine, this should cure anything that ails you. This book, while part of a series, could be read without reading the others first, although some minor things will make more sense if you have. 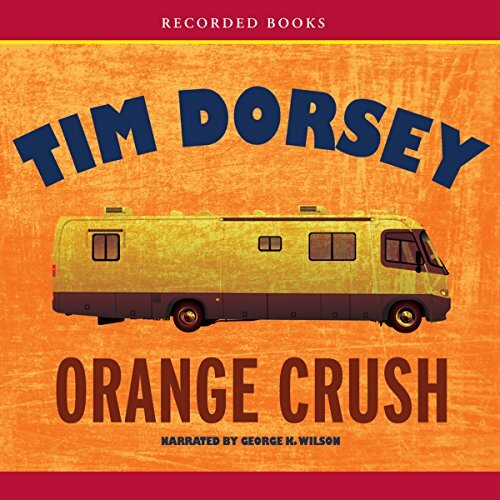 I decided to try a Tom Dorsey novel and Orange Cruse was my selection. It is a satirical novel and was moderately fun to read, but I did not find the humor and satire especially compelling. There are to many excellent novels available for me to listen to more Tom Dorsey books. It's good, but not good enough. Would you listen to Orange Crush again? Why? There are some amazing twists that come together all through out the novel that makes me think I may have missed a few really funny ones. Very entertaining! What was one of the most memorable moments of Orange Crush? When Marlin's fiance decides to tell him the engagement is off because she has found someone see who appreciates her puppets. Since its his press secretary, they will be forever entwined anyway! What about George Wilson?? ?s performance did you like? His voice and timing are extraordinary! Here is my Storms warning: if you're looking for the next volume in Tim Dorsey's Serge Storms series, this is not it, despite it being labeled as the third entry. Serge, the lovable sociopath with an encyclopedic knowledge of Florida and an unwavering moral compass, does figure in as a side character, but he is not the main character of Orange Crush. This is especially important for readers of the first two Serge Storms books, Florida Roadkill and Hammerhead Hotel, because that story line is ongoing -- entry #5, Stingray Shuffle, is the conclusion to that trilogy. Nevertheless, you might be pleasantly surprised (as I was) to find that Orange Crush protagonist Marlon Conrad is a capable stand-in for Serge in the moral compass department. Marlon is not deranged like Serge, just naive, despite being governor of Florida. But he regains his political sanity in a remarkable sequence set in war-torn Kosovo and proceeds through the rest of the book as if he is a sane version of Serge setting things right (minus the Rube Goldberg vigilante killings that are Serge's stock in trade, here left for another character to commit). So overall, I heartily recommend Orange Crush to both Dorsey fans and newbies. Fans, don't worry about Serge not being all there. Newbies, getting a dose of Dorsey without the shock of off-the-wall Serge Storms is a nice way into his world. But fans and newbies alike will enjoy this send-up of politics, written a year after Florida botched the presidential election of 2000. Sure, a lot of the satire is easy-pickings, low-hanging fruit. But Dorsey does a nice job of skewering all points on the compass, moral or not, going to the well-worn but tried-and-true territory of looking at the system from the point of view of a jaded politician having come to his senses (a la Carl Hiaasen's Skink, also a rogue Florida governor). Twisted topical black humor at its best. These are always worth the listen. Twisted topical Florida black humor at its best. John D McDonald would be proud. always an adventure. I love this series of books. if you like violence humor and adventure this is for you. it's all rolled up in one book! If you love Florida and Florida politics (who doesn't) you'll love this great work by Dorsey. Enjoyable if you can get past the stilted narration. The story is goofball Florida, and the characters are hilarious. Slow at first but picked up and kept my attention. Enjoyed book. Very similar to previous books.